This post was written for the Insecure Writer’s Support Group where we share our encouragement or insecurities on the first Wednesday of the month, to join the group or find out more click here. Welcome to April 2019! My wish today would be to help me write a scene with my character Brooklyn in a fantasy/sci fi story titled Dreams and Hourglasses. I need to have readers connect more emotionally to her in the beginning. I am trying to build the story and not overexplain right away but I am leaving my readers wanting. I asked my writing group for recs for stories that have strong emotional reactions and was reminded of All Summer in A Day by Bradbury. I will study it again later today. I will also break out the Emotional Craft of Fiction and do some work from that text. This post is for Alex Cavanaugh’s Insecure Writers Support Group (click the link for details on what that means and how to join. You will also find a list of bloggers signed up to the challenge that are worth checking out. The first Wednesday of every month, we all post our thoughts, fears or words of encouragement for fellow writers. Today’s question is my own – What point of view do you prefer to write in? In most of my writing I prefer to write in first person. I think this is partially because the reading I am drawn to is the first person format. I love to get inside a character’s head and know what they are thinking and why they are making the moves they make. My novel, however, is written in third person because I include several different character perspectives. It is still in revision so that may change! 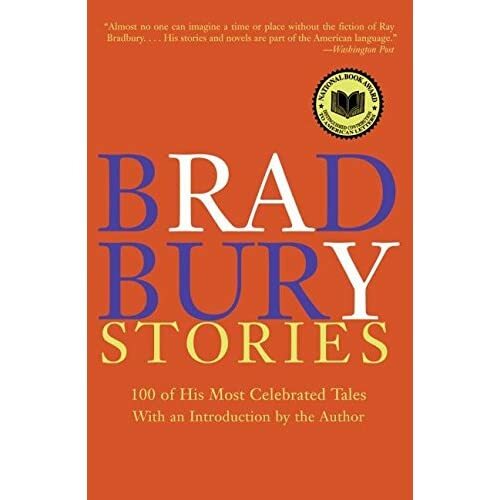 On another note, yesterday I picked up Bradbury’s 100 story collection from the library. It is a doorstop of a book and I am looking forward to diving into it at lunch time today! I use his writing as a mentor text and am excited to read and ponder! Today’s question – Besides writing what other creative outlets do you have? Writing is my absolute main creative outlet and thinking tool but I do use some other creative outlets to keep my well filled. I love to draw spirals, coffee cups, ribbons, and fancy writing on my notes and in my bullet journal. To hear me talk about my bullet journal you can listen here. I used to rubber stamp and now I buy blank cards with envelopes and decorate them with stickers and doodles. I use cards mostly at work to thank people but am reviving my letter writing hobby. Blogging is writing but I can play with the format. I write lists, post pictures and ask questions. I love life-giving conversations with people. I love to ask unusual questions and really hear about people’s lives not just about the weather. This is also fuel for writing. Overheard conversations, especially in airports, are my favorite for short story writing. I like to give myself challenges and assignments. Lately, this has manifested in the form of blog and writing challenges. Everything on this list ties back to writing! It is ingrained! I have experimented with eating vegan, going blindfolded for a day, eating vegetarian, a shopping ban, reading only books I own, etc. Running was the experiment that became a lifestyle! Intermittent fasting is a regular system for me now as well. I am always looking for new ideas so feel free to share in the comments! What creative outlets so you have? This post was written for the Insecure Writer’s Support Group where we share our encouragement or insecurities on the first Wednesday of the month, to join the group or find out more click here. Welcome to 2019! Ray Bradbury’s words have been popping up over the last year. This is the quote lately that has stuck with me. I enjoy the reality I live in most of the time. I have crafted my life differently over the past year to made that so. I like the idea of being drunk on words in this context. It gives a different perspective on “writing drunk”. I love the worlds I write and create in! It is only one advantage of being a writer! 1.Coffee or Diet Coke depending on the time of day. 4. Composition notebook and computer – I actually have been gravitating toward the Chromebook. It is nice for drafting and a nice size for my little baby hands! It also fits nicely in my purse. What is in your writing space? Are there special things you like to have around you when you write? For December I will continue to write everyday. I will submit at least 2 stories. I will blog and lightly participate in BLOGMAS. I am creating a writing challenge for myself and others who want to join in on my blog. I am signed up for an editing class at the end of the month and will fully participate in that class! It’s time for another group posting of the Insecure Writer’s Support Group! We post the first Wednesday of every month. Our purpose is to share and encourage. I hope my post does just that. November 7 question – How has your creativity in life evolved since you began writing? I have always been a writer and interested in creativity. I think that I had a narrow definition of what creative meant even after all the creativity books I have read over my lifetime. As I have lived I have opened up my perspective of what creative is and what it looks like. It doesn’t have to be a free spirit artist person – but it can be. My evolution has expanded my thinking to knowing creativity is everywhere. It is in the lines that come to my head for writing that I now write down. It is the doodle I draw in my bullet journal. It is the new recipe I try for dinner. It is in the new thinking pattern I have from reading other blogs and other writers that fuel my own ideas. It is the walk I take among the trees and the whispers I hear from them to fill my heart. It is the way I look at paintings and short stories and novels and appreciate them and then how to unpack the elements to get inside the artist’s mind to learn something for myself. Creativity is a beautiful lens to look through every day!